I never really gave much thought to the Aran Island sweaters, other than to think that they were warm and fashionable; on a recent trip to Ireland, I learned that each sweater, or rather its stitches, tells a story. 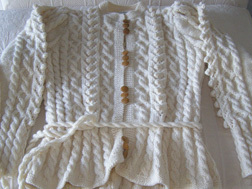 Since I do not knit, I never really looked at the weaves or the stitches on the Aran Islands sweaters other than to note that the hand knit creamy off-white Irish sweaters were attractive, warm, fashionable, and that they last a long time. I had always looked at the sweaters as a whole, and not as a sum of their parts, or in this case, a sum of their stitches. Wandering into a woolen shop in Kenmare in County Kerry in September 2007, I was totally surprised when the clerk told me that there is a special meaning attached for each of the stitches used in the complex designs of the Aran Islands sweaters. The Aran Islands are located off the West coast of Ireland where the elements can be rough and the community earned its living by farming and fishing. The sweaters they wore had to be sturdy, yet each maintained its uniqueness by the stitches used. There are many different stitches used in the Aran Islands designs, and the meanings of the stitches often revolve around the fishermen and the sea. A few of the intricate stitches used include: Cabling which is more than merely decorative, it represents luck or the fishermen's ropes; the Diamond pattern represents wealth and success; the Blackberry represents nature; the Basket represents abundant catches; the Tree of Life represents family; a Zig-Zag represents love; Irish Moss represents nature and wealth for the fishermen; the Honeycomb represents abundance and wealth; the Ladder of Life represents health and a long life; a Trellis represents success; the Trinity stitch represents the Holy Trinity; and the Link represents those who have left the island. 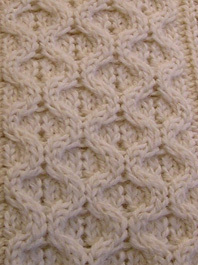 By varying the stitches used on the sweater, the knitter can create many different patterns, in essence creating a little "story." As I learned the meanings of the stitches, I made a little game for myself by trying to "read" the story of the sweaters in the many shops that I encountered throughout my trip. 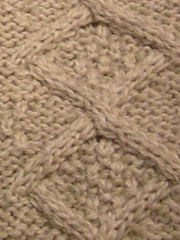 When I returned home from Ireland, I immediately went to my closet and pulled out my favorite Irish hand knit sweater that had been a gift to me long ago, and with my newfound knowledge of the meaning of the stitches, I decided that I would "read" my sweater to determine the meaning that it held. What fascinating story would my sweater tell? What wishes were behind my gift? 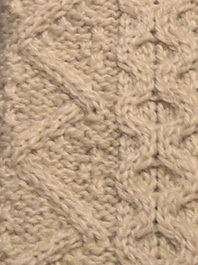 With the meaning of the stitches in hand, I carefully looked at each of the stitches on my sweater and was delighted to find that there were Diamonds indicating wealth and success, and Cabling for luck. What a wonderful pattern, or "story" my husband had picked out for me. This season when the weather turns cooler and I wear my sweater, I will smile to myself and remember the story my sweater tells. Whether you already own an Irish knit sweater, or are in the market to purchase one, be sure to look at its stitches and the unique story that it has to tell. Although they say fashion always tells a story, what story will your sweater tell? Please read other articles on Ireland in the Hotels and Resorts, Restaurants, Chefs' Recipes, Spas, Liquor Cabinet: Celtic Crossing Liqueur, Boru Vodka, Knappoque Irish Whiskey, and Adventures sections.